Deep in the heart of the Dragon’s lair lies a treasure chest that is overflowing with gold and other valuable precious metals, but it’s being guarded by the ferocious Dragon who spits fireballs at anyone who attempts to get their mitts on it. Are you brave enough to risk the wrath of the Dragon for an opportunity of escaping with lots of highly valuable treasure? 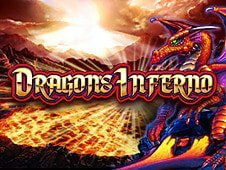 With superbly designed symbols that really bring the fantasy storyline to life, the Dragon’s Inferno slot machine also boasts two rewarding slots bonus features - the popular Replicating Wilds feature and a free spins mode which can see you spin the reels up to forty times for free! Dragon’s Inferno uses the popular G+ Deluxe game engine which was used in fellow WMS slots like the Zanzibar slot machine and the Kronos slot machine. This means it consists of 5 reels and 30 paylines and with bet per line options ranging from 1p to £3 this means that you can play for real money from 30p to £90 every spin. While it also boasts a generous 95.97% RTP and detailed symbols that enhance the fantasy theme, unfortunately WMS lacked imagination in regards to sound effects as they are the same boring sounds we hear reused in so many of their titles. This fantasy adventure comes to life on the reels with fourteen sensationally designed symbols featuring which boast great detail. Three of these are special symbols with the standard Wild symbol being the Treasure Chest which appears on the first, second, fourth and fifth reels (which is the most valuable symbol of all) but there is also a symbol of the Dragon guarding the Treasure Chest which only appears on the third reel, but both symbols have the power to substitute for all others aside from the Feature symbol which is the fiery Dragon who poses in a powerful and terrifying manner. Other impressive symbols include Knights clutching their long shiny swords, Archers about to fire an arrow and female Elves who are casting a spell with their magical powers. On the lower end of the payout structure is a Spellbook, an Emerald Sword, Crystal Ball, Potion, plus poker suit symbols of Spade, Diamond, Club and Heart make an appearance and have the lowest values of all. Replicating Wilds feature is also commonly referred to as the Transferring Wild feature and it is a welcome inclusion in the Dragon’s Inferno slot machine. Every time you land the Dragon guarding the treasure (which only appears on the third reel) he then shoots out a fireball which will land on random positions on the reels, with all positions that the fireball lands on then turned Wild to create additional winning combinations. This actually happens very frequently and is always exciting! It’s easy to escape the Dragon’s lair with very big wins as all winning combinations have a 2x multiplier attached, the Replicating Wilds feature remains active, plus stacked symbols can also appear on the first and second reels throughout the free spins mode which result in lots of treasure! This isn’t the first Dragon-themed slot machine we have encountered with one of my personal favourites being Bally’s Jewel of the Dragon slot machine which sees a Dragon guarding a highly valuable jewel and you having to try and wrestle it from his clutches, much like Dragon’s Inferno where you are trying to escape from the Dragon’s lair with all of the treasure he is protecting for big wins. Despite the lack of originality in regards to sounds, the intricately detailed symbols, the Replicating Wilds feature, and the rewarding free spins mode all make up for this and it’s definitely worthwhile entering the Dragon’s lair and taking a shot at escaping with some of that valuable treasure he is guarding!